Stylish and sophisticated, the Audley Oak Bar Stool Charcoal Fabric is sure to enhance any space with its elegant look. 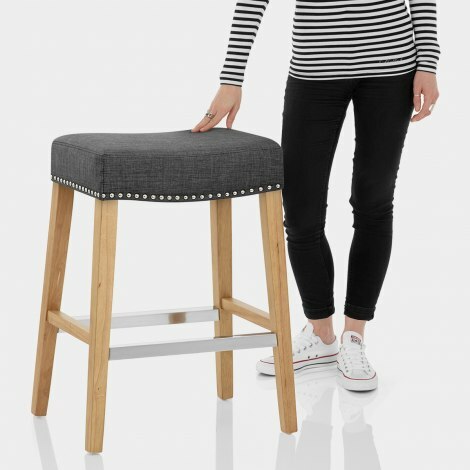 The Audley is a glamorous take on a classic backless stool, offering a fashionable space saving option for both modern and traditional environments. Soft charcoal fabric covers the rectangular seat, which is filled with premium belting within for a cushioned feel. 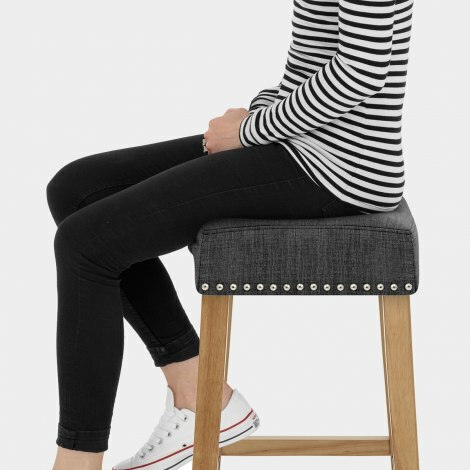 For a truly refined finish, ornate studs edge the seat, which is backless and compact. The seat is supported by a solid oak finished four-legged frame, which is fixed at the perfect height for use alongside kitchen worktops, islands and breakfast bars. Bolstered by polished chrome bracing bars, the frame imparts excellent stability, plus the supports double up as handy footrests. It also includes protective plugs beneath the legs, designed to help to protect your floors from damage. "These look lovely and are very comfortable"
Very happy with my stools. Excellent quality. Look lovely in my kitchen. Highly recommend. I’ve been looking all over for some bar stools and I found this website by chance. I fell in love with these as soon as I saw them, as they are a bit different to the usual choice on offer elsewhere. The ordering process was easy and they arrived as promised the following day. Even better is that the stools are just as lovely in real life and I’m over the moon to have found them. I was worried that they might have been a bit short but they in fact are the perfect size! Couldn’t be happier! Lovely stools and super quality. Thanks. These look lovely and are very comfortable. They are good value and we are very pleased with them. They arrived very quickly too, good service. Good value for the price. Excellent service & delivery. Easily assembled.